The love letters she wrote somehow get delivered to every boy she has ever had a crush on. I can’t even imagine—seriously. My heart cringes at the thought of all the boys I ever felt anything towards knowing the truth. And what’s even worse, her sister’s ex-boyfriend is one of those boys. So, in order to keep him at a distance, she decides to fake-date another boy that is on the list. Not only that, but he is also the most popular “handsome” boy in the school. He agrees to this fake-relationship not to help her out, but because he wants to get away from his ex that he can’t seem to stop getting back together with. But what if there’s a moment where it no longer feels fake, and Lara Jean begins to think that maybe she does have feelings for him? Han does a great job at juggling the subplots that are going on throughout the story. She will make you cry, cringe, laugh, and fall in love with her story. Although some things aren’t completely flushed out at the end, and the novel does leave off on a little bit of a cliff hanger to make the reader wanting more, it is definitely a novel you want to check out if you love Young Adult Romance. Also, don’t fear about the cliff hanger, as book 2, P.S. I Still Love You, is also out now. (But don’t read the back of that book because of spoilers). The characters in To All the Boys I’ve Loved Before are well-rounded and none feel as if they are flat. She definitely starts out trying to make you think they will be the stereotypes, but then you grow to know them and love them, just like you would in real life. Some of the conflict as well comes from characters thinking other characters are stereotypical. Han also had some great references, not quite dating the book, but making it so readers now could feel the same enjoyment of pop culture as the characters do. I mean, who wouldn’t want to marathon Lord of the Rings in one day? I give this book a 4.5/5, it is very well written and a heartwarming story, but some subplots felt as if they hadn’t been finished. 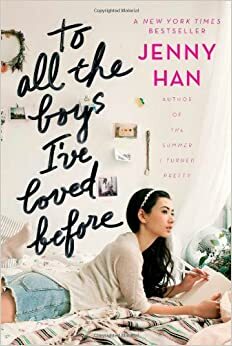 So, if you need a novel to relax with, be sure to check out To All the Boys I’ve Loved Before.